Thanks. Making a project file and importing playmaker just in case the theme fits what I can do. This would be my first game jam, only vaguely heard about them, and have no idea what kind of themes to expect. Sorry to say i had to cancel my participation, have fun to all! Here is the latest version, you can get it from the attachment below. I did not have time to test a lot on the latest version, but it looks good so far. Btw good luck to everyone! We are just 12 hours away from the start, which means.... theme announcement! We have 2 different themes. 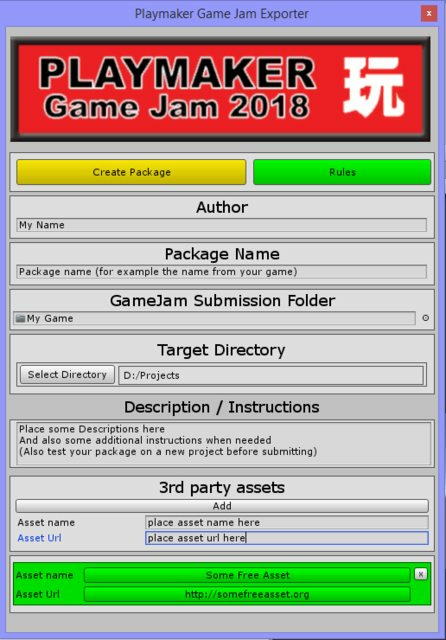 You can pick one or both themes for your game jam project. Also, don't forget, it is ok to setup a new unity project, setup playmaker and bookmark any assets/resources you think you might want to use. HOWEVER, do not start your jam until 12 more hours. I didn't understand these two themes. Aren't Last Resort and Not A Hero two games which already exist? Will it be something related to these games? Or do I make a game related only to the name. It is just a theme, not referencing to any existing material produced. Not related to any existing art/thing (game, movie, book, painting etc.). Hope to see you participate in the jam! Correct. They are just abstract themes to apply to your game. How you apply them is up to you, however, your game must apply to them in some way. Also, on your itch page when you upload your game, you will need to say how it applies. I'm stuck before I've started. I have no ideas right now. I am also afraid if I make something, and it's not correct, so I think I cancel this time. Maybe I can join next time, if there will be a next time. I'm sorry! Rabagast, join us on slack and chat. There are a bunch of people online today. We are all doing game jam there. Why not come and get some ideas! Hi, seems like it is not working for me. Doesnt include my selected export folder. I ran the newest version and an earlier version. System in PC, windows7, unity 2017.3. To everyone else. Please submit your game (without source files) to itch at the deadline end. (Monday morning 8AM PST). We will allow for 1 week before the source files need to be submitted. Due to space limitations of itch, dropbox will be accepted (or other file hosting). Please send the link to me, or post the link on your itch page. Hi, did you drag in the folder? Also select a folder where to save the package. Thanks. I just gave it another try now. Dragged the folder in with all of my exports (see screen shot of everything in my export folder). When it makes the package, it doesnt include any of that folder. Oops! i am very sorry, i accidentally edited an old version and uploaded that. You can get this version (only tested on windows), and i changed also the ones on the other posts just to be sure. Just tested this version with MacOs and seems to be working.